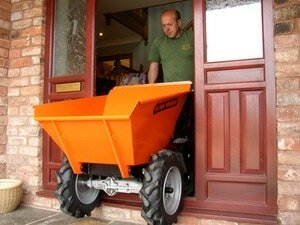 Muck truck power barrow for builders and landscapers. 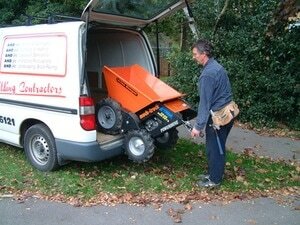 The motorised muck truck power barrow range of powered wheelbarrows are great for moving building materials in tight spaces. The muck truck power barrow is available with a full range of accessories which are ideal for skip loading, moving dirt, gravel, paving slabs, concrete and wet cement straight from the belle cement mixer. The four wheel drive muck truck is a power barrow for moving all kinds of building and landscaping materials over almost any terrain, effortlessly! It has also become very popular with tree surgeons and woodland owners for extracting logs and timber. The muck truck power barrow is just 710 mm wide making it easy to manoeuvre through garden side gates and narrow access areas. When compared to using a normal wheelbarrow the muck truck power barrow will speed up productivity typically by 400% whilst considerably reducing operator fatigue. When extra traction or stability is required the muck truck can be fitted with twin wheels. Grass tyres can also be fitted when low ground pressure is required to protect against damaging the lawn. The muck truck and max dumper are both powered by a Honda 160cc GXV commercial grade 4-stroke engine, giving it a performance similar to a micro dumper. The 250 kilogram capacity muck truck will literally climb over obstacles, steps and up steep inclines, carrying a quarter-ton load twice as fast as tracked machines and up to five times more than a normal wheelbarrow. The max dumper has a 365 kilograms capacity adding the benefit of shifting larger loads of building and landscaping materials at a fraction of the cost. The muck truck power barrows are stable and perfectly balanced, their center of gravity allows the skips to be easily emptied without the added expense of a hydraulic powered system. They are as easy to steer when fully loaded as they are when empty, having 3 forward speeds and 1 reverse speed meaning less fatigue on the operator. For fast skip filling, transportation of paving slabs, bricks, rubble and site waste. For carrying rolls of turf, soil, gravel, mulch and waste materials. For moving plants, large shrubs, rocks, small trees, compost and bulky garden items. For moving bales of straw and hay, feed, horse manure, general muck and rubbish. 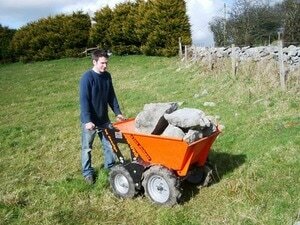 Can be hired to both commercial and domestic users as an effective power barrow instead of the use of a wheelbarrow. Dimensions: Length 155 cm/61" x Width 71 cm/28" x Height 85 cm/34"
Please click above to buy 10W/30 mineral oil. Works well with a number of other appliances, such as mini diggers and cement mixers. 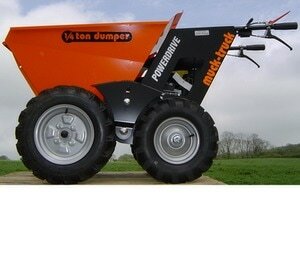 The mini dumper has been in production for over 14 years. Honda GXV engine comes with a 24 month Honda backed consumer and commercial warranty. Can change mini dumper attachments in seconds. Tests have proven the Muck Truck moves approximately 5 to 6 times the amount a wheelbarrow does and approximately 2½ times the amount of material compared to a tracked skip loader or tracked skip carrier in the same amount of time. The muck truck is simple, quick & easy to use. Easy to steer, just like a wheel barrow. Day after day usage without backache and pains. 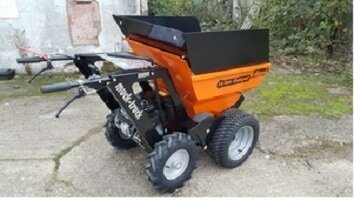 This mini dumper saves time, money and increases productivity. 4x4 muck truck Powerdrive - climbs 30° slopes, go anywhere capability. Carries approximately 2½ wheel barrow loads. Muck Truck ramp attachment enables safe, easy skip loading, also trailers and open back vans. Muck truck flat bed attachment enables paving slabs, bagged products etc to be easily moved. Only 0.7M/28 inches wide - fits through average door or gate ways. Rides over the ground, where tracked skip loaders and tracked carriers cut into ground's surface & are a lot bigger, slower & awkward to operate. The muck truck can also part load tip. Transportable – the muck truck climbs into and out of vans on its own with no need to leave on site. 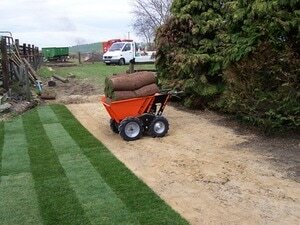 The mini dumper carries 15 x 1M rolls of turf. Quick payback time against your investment. Many other muck truck attachments available. 1. Q - Can I fill up a skip fully using just the Muck Truck and loading ramp? A – Yes, Once you have filled the end you are loading from, simply drive the muck truck into the skip with the bucket in the tipped position (90°) and push the dirt or materials across the skip to the other end, then work your way back with each tip to the loading end, this way your Muck Truck can fill up a skip completely. 2. Q – What is the parts ordering process? A – Parts are kept in stock, if you process your order by 12noon you will receive your parts on the following working day. 3. Q – Why is the Muck Truck so stable? A – The power barrow is built on 4 wheels, it has a low centre of gravity, also the centre point of the machine ensures that it is stable, especially useful when filling the muck truck using a micro or mini digger. 4. Q – What is the Muck Truck four wheel drive system and why is it so effective? A – The power drive is what enables it to travel up inclines up to 30° with a full load, it works by all six wheels being connected to each other under tyre friction, the front wheels are the driving wheels, which in turn create a reverse motion of the smaller centre wheels, which in turn creates drive into the rear wheels giving the four wheel drive system. 5. Q – How do I know if I have a MK 1, 2 or 3 model Muck Truck? A – Every machine has a serial number marked on an ID plate, simply quote this number and we can tell you. 6. Q – How do I change direction when using my Muck Truck? A – Due to the power barrow being perfectly balanced whether loaded or unloaded, you change direction like steering a wheel barrow with a very slight lifting of the handle bars and then you turn accordingly. 7. Q – Does the Muck Truck start easily? A – Most definitely, almost everyone can start the muck truck with ease. 8. Q – Is the Muck Truck complicated or easy to use? A – It is the easiest to use mini dumper in the marketplace today, easy starting, simple steering due to the wheel barrow type technique and most of all its perfect balance, unlike complicated skid/steer skip loader type dumpers. 9. Q – Do Muck Truck UK have a network of dealers offering after sales support on their products? A – Yes, the Muck Truck has been in production since the late 80s and has a very well established dealer network to support its customers. These files are in a pdf format. This means you will have to have a pdf reader installed on your computer. You can download one for free at Adobe. Keith, we have only had our muck truck a week but already we are finding a 101 uses for it! My niece who is 34 went and collected ½ ton of sheep feed which was 25 bags at 20 kgs each, normally we would struggle with 3 bags at a time pushing the wheelbarrow through a muddy footpath and a narrow gate, using the muck truck she did all 25 bags carefully stacked in only “two trips” and the muck truck just drove through the mud as if it wasn`t there, from the front of the house to the storage shed is about 400 yards, very impressive! We mainly bought the muck truck to clean out our chicken sheds in the winter, we pull out the “droppings boards” and using a hand held back hoe tool we scrape the droppings straight into the muck truck but the real benefit of the muck truck is that it holds so much more compared to a wheelbarrow and it just drives effortlessly through our wet muddy conditions. We have also been using it this week for repairing our footpaths which we are regularly filling the uneven areas where puddles/mud seems to form, our neighbour has a number of broken roof tiles and we have some general rubble that we use so the muck truck has been very useful for this job. Also, I can see that I will use it for lots of different jobs around the farm, the muck truck is proving to be a very useful time saver, both my wife, niece and myself have found it very easy to use. Thanks again Keith for an excellent service from start to finish, I would be more than happy to act as a reference to both Fresh Group and the muck truck product. Myself and Clare are both in our 50s and when manually poo picking we would certainly feel aches and pains in our lower back and legs, now we have our Muck Truck it`s a breeze. When we spoke to Keith about purchasing the Muck Truck he advised us that the skip extensions would be very useful to bulk up the volume of the Muck Truck and they certainly have done that, I would say we get at least 5 times the amount into the Muck Truck than we would into a normal wheelbarrow, we have to empty about ½ a mile away from the paddocks, now we are only making 1 trip compared to 5+ trips! Roughly speaking I would say, what would have taken us 45-50 minutes is now taking us 10 minutes, but just as important, myself and Clare are a lot healthier in ourselves because the Muck Truck is saving our lower back and legs from wear and tear! Keith thanks for an excellent service, your knowledge and advice has been invaluable, from start to finish we found your company and the product 1st class, guiding us to get the skip extensions was a definite winner. We bought our Muck Truck Max last year back in March 2011. I have to say “It`s probably one of the best things I have bought in my business and I should have got one years ago”. 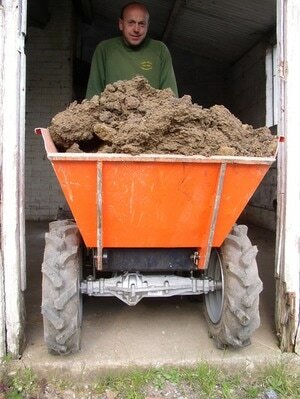 I use the muck truck in my building business and my wife nicks the muck truck for poo picking her 3 acre paddock where she keeps her 2 horses, the paddock is on quite a steep hill and it used to be a nightmare when doing manually with a wheelbarrow, now it`s a doddle! For me - well it gets used regularly, being very easy to transport around in my Volkswagen Pick Up. Overall I would say the muck truck is 4 to 5 times quicker than doing the jobs manually, as a small builder a lot of my work is house extensions where access is a problem, the muck truck is very quick and easy to use and fits through side gates with ease, recently we had to lay concrete where access was particularly tight, in the past I would have had 3 men on the job, now, using the muck truck it just needed 2 men, one using the muck truck and the other finishing the concrete, when barrowing the concrete I would say we were able to carry at least 4 times the amount using the muck truck than we would have with a normal wheelbarrow with the guys being “completely finished by the end of the day`s work”, we also have loaded it using a site cement mixer. On your advice we also bought the muck truck flat bed attachment which we can change over in seconds, we use it a lot, to date we have moved paving slabs, blocks, bricks, mono blocks. As you know we purchased separately the muck truck snow plough attachment last December, we have used it to clear snow on a number of occasions since, we have a large drive area and also a very large patio, I was amazed at how well the muck truck did the job, I would say about 10 times quicker than I have ever done it before, excellent! Keith, I have been VERY pleased with my muck truck purchase and your company, you gave me excellent advice and guidance in my investment from the moment I spoke to you, please feel free to use me as a reference for any of your new customers, regards, Kevin. Thanks Keith for supplying our Muck Truck Max dumper, we use it to maintain a 50 acre private estate. In the main we use the Muck Truck in the closed quarters of the estate (about 5 acres I would guess) we tend to use it like a high capacity powered wheelbarrow, we have quite a lot of steps and lawned inclines to get to different levels of the grounds, the muck truck climbs the steps and drives up the inclines with ease, it`s at least 3 times faster than a conventional wheelbarrow and I can get a lot more done in a day because I am nowhere near as exhausted as I used to be when using a normal wheelbarrow. We use the muck truck in conjunction with a small tractor and trailer, the muck truck carries everything from soil, hedge cuttings fallen branches, dead flowers, fallen fruit, leaves, just about everything. From our first conversation to the prompt delivery coupled together with your obvious knowledge of your product and understanding our needs I feel the whole experience has been a pleasurable one and I would have no hesitation in recommending both your company and the muck truck product to any of your future customers.